Chickens are not, as a rule, part of the fauna of any mountain, but that didn’t stop the inhabitants of the highlands known as “Tara Motilor” from baptizing one of the highest peaks of the Apuseni Mountains with the unlikely name of “Muntele Gaina”, which literally translates as “Chicken Mountain”. And funny as it may sound, there are even two legends explaining the name, both told by those who still remember them around the bonfires lit at the unique Festival dedicated to this mountain. The first of these legends tells of how the inhabitants of Vidra de Sus, a village at the foot of the mountain, who used to be employed mainly in extracting gold from the mines abundant in this area, kept seeing a golden hen exiting the mines and retreating to a nest on top of the mountain to sit on its eggs. They made several attempts to catch it, which eventually resulted in the hen getting scared and running away forever, hiding in the belly of the mountain along with all the gold. Since then, they say, all the gold disappeared from the mines, and people stopped looking for it, whereas the mountain aptly took the name of the hen. The second legend is more romantic and ties in with many of the traditions still observed today at the “Muntele Gaina Festival”, and in particular with the Maiden Fair. It tells of a rich and beautiful fairy who had a golden-egg laying hen and who used to gift such an egg, once a year, to one of the nice but poor girls of the community who couldn’t get married for lack of a dowry. The locals and the fairy lived together in harmony for a long time, until, driven by greed, five young men from the Vidra village disguised themselves as girls and snuck on the fairy’s home, discovered where she kept the golden-egg laying hen, and stole it together with its basket full of eggs. However, in the rush of their escape, the man carrying the basket dropped it, and the eggs fell into the furious waters of the Aries River, that still glitters gold from time to time. Panicking, the young men hid the hen in the Abrud Mountains, which remain, to this day, famous for their rich resources of gold. The facts of these legends might belong to a distant past, but the “Chicken Mountain” is celebrated even now in an annual festival dedicated to both the mountain itself and its inhabitants, and in particular the local young women wishing to get married. 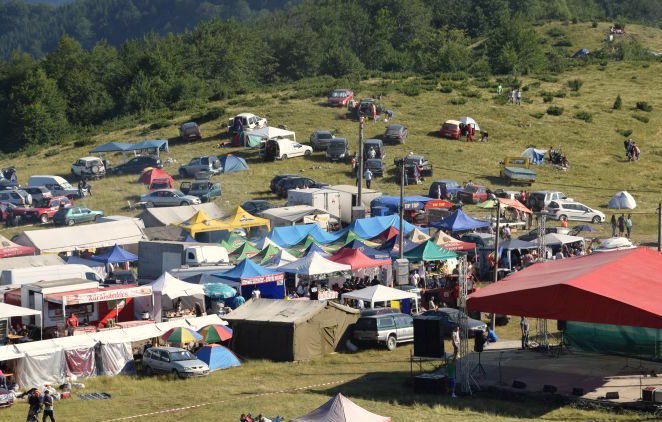 The event, traditionally held in July on the Sunday closest to the Feast of Saint Elijah, started as a meet-up of the locals from the various villages in the valleys of the mountain, who came together mainly to exchange products and brought their sons and daughters along so that they could get to know each other and marry if they chose to. The girls and women in particular went to great lengths to prepare for the occasion, packing up their dowry in elaborately sculpted trunks. The weight of the dowry was then measured against the weight of the girl, to make sure it was appropriate. Another key ritual was dancing, to ensure that the girl didn’t have a lame leg. If a couple was formed following these rituals, they could choose to be married on the spot by one of the priests come to the event for this particular purpose. 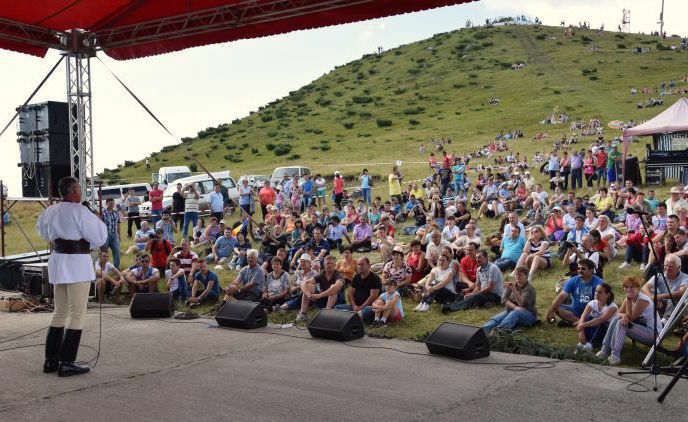 Today the “Muntele Gaina Festival” has added elements of modernity such as music concerts and open air parties, as well as various competitions celebrating local crafts and arts, as well as the many charming traditions of the area.